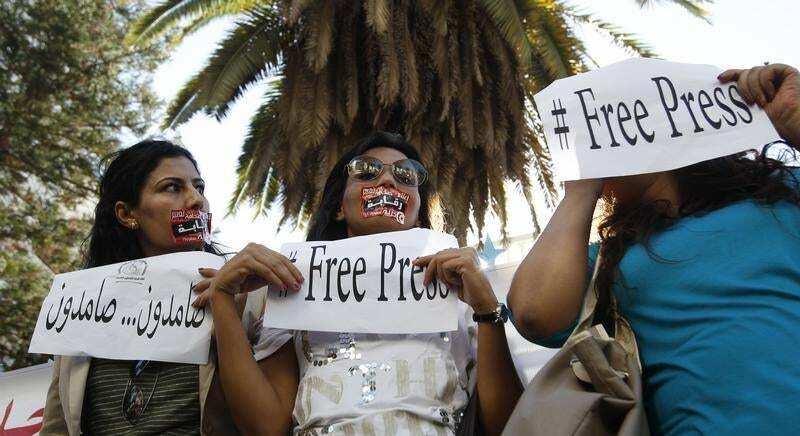 Tunisian journalists protest for freedom of speech in Tunis on October 17, 2012. Ethiopia’s journalists shouldn’t be spending World Press Freedom Day in jail on trumped-up terrorism charges. Freeing these journalists would be an important step toward improving Ethiopia’s deteriorating record on press freedom. Leslie Lefkow, deputy Africa director. (Nairobi) – The Ethiopian government should mark World Press Freedom Day, on May 3, 2013, by immediately releasing all journalists jailed under the country’s deeply flawed anti-terrorism law. On May 2, 2013, the Supreme Court upheld an 18-year sentence under the anti-terrorism law for Eskinder Nega Fenta, a journalist and blogger who received the 2012 PEN Freedom to Write Award. Woubshet Taye Abebe, who is serving a 14-year sentence under the anti-terrorism law, was a winner of the 2012 Hellman-Hammett Award, administered by Human Rights Watch. Woubshet was the deputy editor of the Awramba Times prior to his arrest in 2011.He alleged in court that he was tortured in pretrial detention, as have other defendants detained on terrorism charges. The court did not investigate his complaint. In 2012 Hailemariam Desalegn became Ethiopia’s prime minister following the death of Meles Zenawi, under whose leadership the country experienced a sharp decline in civil and political rights – including freedom of expression. Hopes that Hailemariam’s government would improve Ethiopia’s record on free expression have been dashed by ongoingarbitrary arrests and detentions of journalists and others. Since January 2012, members of Ethiopia’s Muslim community have held regular protests in the capital, Addis Ababa, and other towns over alleged government interference in religious affairs. The government has harassed and detained journalists who have reported on these protests. Yusuf Getachew, former editor of the now-defunct Islamic magazine Yemuslimoch Guday, was charged under the anti-terrorism law and is on trial, though the trial is closed to the public. Solomon Kebede,Getachew’s successor at the magazine, was arrested on January 17 and has also been charged under the anti-terrorism law. Prior to charges being bought, Solomon spent more than two months in pre-trial detention at Maekelawi prison in Addis Ababa, which is notorious for torture, without access to legal counsel.